Now's the time to be thinking about my blog for the new year. Dark Treasury's been doing pretty well. Thanks to all of you! Engagement and pageviews are consistent. I remember, years ago, when it felt like I was talking to myself. I'd miss a day posting and lose followers. Now, that doesn't happen. Thank God. But, the blog's not growing. Hasn't grown for awhile. A couple of weeks ago I came across Blogging for Authors: How to Create a Blog that Can Grow With Your Career by Anne Allen. I got some interesting blog post ideas. "Focus on your genre or subgenre (unless you’re still experimenting with different genres.) You can discuss movies, videogames, TV shows, even jewelry and costumes—as long as they relate to your niche. Offer links to important information. If you’re writing a memoir or fiction about certain health issues, promote organizations that help with those issues. Link to support groups and they might even link back. Provide people with the benefit of your research. If you’re writing historical fiction about a certain time period—post the research on your blog. (This is doubly useful because it will help keep you from cramming it all into the novel at the expense of story.) Have to research guns for a thriller? Poisons for a cozy? Are you basing the story on a real case? There are people who would love to read about this stuff." 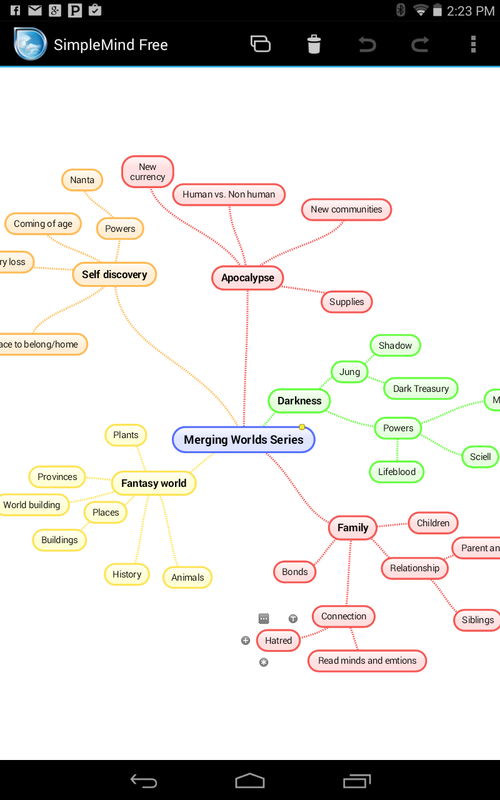 Because of this post, I download a mind map app SimpleMind Free and started mapping out potential topics and subtopics. I've done a lot of research for my novels. Now, I just need to find a way to write more blog posts out of that information. I've been taking classes in publishing, but I haven't done much blogging about the things I've learned. Gotta do something about that.